Does Racketball have a new name? The venue for the Super12 was the tranquil and beautiful surrounds of the Ardencote Manor Hotel, Claverdon, Warwickshire. Fortunately the snow held off until the tournament was well under way and the organiser was glad he had selected the Saturday for the event, rather than the Sunday. The competition was an open event on a first come first served basis as it was a tournament restricted to 12 entries alone and these coverted positions were all filled by the first days of December with demand great. The competition attracted the cream of the Racketball talent from the West Midlands area and boasted some county number ones and a few finalists from the national age events from recent years. With such a high quality draw the tournament did not disappoint. The opening salvo of the mini groups had some tough matches and a few surprise results recorded low down the order however the predicted top 4 seeded players progressed to the semi finals producing some fantastic games. 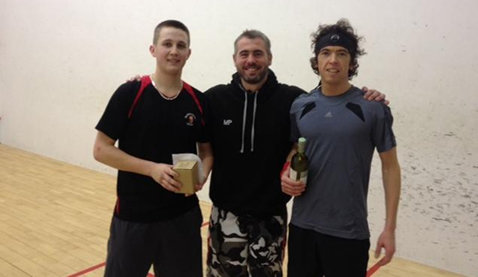 Up first was Ardencotes resident Squash/Racketball pro Guy Pearson. He was up against former national over40 finalist John Blenkinsop who had survived an early scare to come top of his group. Blenkinsop made the early running, going for nick after nick and they were coming off, he took the first set. Play of that intensity could not last and his touch started to dessert him in the second set. Pearson stepped up and took the second. There would only be one winner in the final set and Pearson ran his opponent out to win 2-1. The other semi saw Worcestershire County number 1 Jason Russell against Peter Staunton who had impressed earlier in the year reaching the last 16 of the national open event. This was another nail biter and a brutal match with tremendously long rallies. Score 1-1 and deep into the final set it was Staunton who found that little bit extra to pull through 2-1. With both finalist having expended so much energy getting there, it was impossible to say who would pull through and win the tournament. However it was the younger legs of Pearson that came out on top. Going ahead in the first set he never looked back and Staunton was unable to get the lead in either of the sets, he battled hard but it was the impressive looking Pearson who took the title and the cheque, winning 2-0. An excellent days Racketball produced a thoroughly enjoyable and social day. The tournament was keenly contested and some excellent talent was on display with some big surprises in some of the matches in the lower order. In the 5th/6th place game two Ardencote 1st teamers had to pit their wits against each other with Jon Summers just having the legs on Matt Pugh in the closing stages of the deciding set. Whilst in the C final Shropshires Ian Dinwiddy overcame another Ardencote stalward, Steve Hussey 2-0. It is intended for this to be an inaugural tournament with the ‘Heart of England’ Championships becoming an annual event so look out for entry forms for next years event and get them in early.